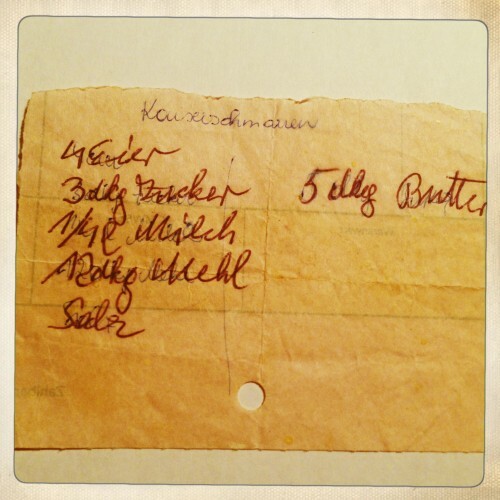 Back then and still today I believe that my grandma made the best “Kaiserschmarrn” (a sort of sugared pancake) of all times. 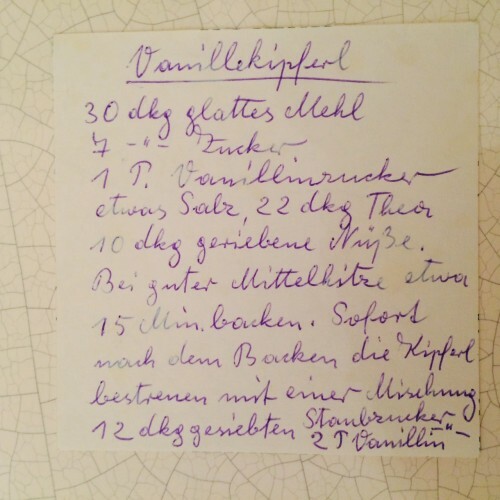 On my birthday, name day or in case of any other occasion for celebration I could always rely on my grandma – she served the beloved Kaiserschmarrn. Good luck! Separate egg yolks from egg whites (4 eggs). Stir sugar (3 dag) and yolk until foamy. Gradually stir in flour (12 dag) and milk (1/4 litre), ie flour, milk, flour, milk, flour etc, until the dough is smooth. Beat egg whites with a little salt until stiff and carefully fold into the dough. Dissolve butter (5 dag) in a pan and pour in the dough, fry until golden, turn and bake like a cake. Once ready baked, the dough is torn apart with two forks into not too small pieces and put into the oven (190 degrees C) for a little time. Once arranged, sprinkle with sugar powder and serve with apple- or blueberry compote. Enjoy! These are, without exaggeration, the best vanilla crescent cookies! They will really melt in your mouth. Try and enjoy! Prepare a dough from flour (30 dag finely ground), sugar (7 dag), vanilla sugar (1 pack), a little salt, nuts (10 dag, finely ground) and lukewarm butter (22 dag). Let the dough rest a little. Form vanilla crescent cookies and bake at medium heat for approximately 15 minutes. In the meantime, mix sieved sugar powder (12 dag) and vanilla sugar (2 packs). As soon as the vanilla crescent cookies are done, immediately sprinkle with the powder and vanilla sugar mix.